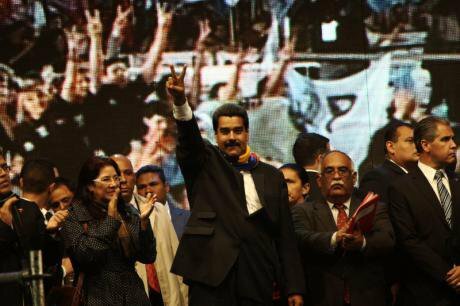 If the Maduro administration steps up the counter-offensive against speculation, such measures might well result in the retention of a Chavista majority in the National Assembly this December. Newly elected President Maduro in 2013. Demotix/ Filippo Florini. All rights reserved. One of the challenges of the Bolivarian revolution in Venezuela today is how to advance towards a communal state in the context of the ongoing reproduction of speculative capitalism, a fall in oil prices, and a relentless counter revolution, the extreme elements of which episodically resort to violent attempts at extra-constitutional regime change. One can observe here that the emancipatory theme expressed in the politics of liberation in Enrique Dussel, clearly influenced the development of the political theory of Hugo Chávez, and in particular Chávez’s ideas about the importance of the protagonist role of potentia (constituent power) in bringing about a transformation in the ethical, social, economic, and political lifeworld inherited from the Fourth Republic. This Dusselian influence is evident not only in the interview with Jose Vicente Rangel quoted above, about the nature of political power, but also in Chávez’s strategic vision of the Bolivarian transition to a communal state. There too we see Chávez’s rootedness in the perspective of popular power while personifying, as President of Venezuela, a leader of constituted power. One of the main pillars of the Chavista alternative, the key to a transition to democratic socialism in Venezuela, is the commune, especially in rural areas. One of the strategic objectives of the Plan de la Patria 2013 - 2019 is the establishment of co-responsibility for governance of the country between voceros [spokespersons] of the communes and local, state, and national government. This objective, as stated in the Plan is “to advance the co-responsible participation of popular organization in . . . the development of plans, works and services in the communities and regions.” The Plan also calls for the public sector provision of financing, training, and inputs to communes with a focus on assisting social production units and for increasing the overall number of registered communes to cover 68% of the population by 2019. The socialidad Chávez had in mind requires the development of horizontal economic and social relations based on the equal dignity of all persons. Once such horizontal structures take form for an extended period they would presumably be resistant to the restoration of vertical relationships of social control. During a delegation visit to Venezuela in 2013 led by the Bolivarian Circle of New York “Alberto Lovera,” the author was able to engage with comuneros and comuneras who were actually practicing this new socialidad. Maduro, in a move faithful to the legacy of Chávez, promised to make the ‘commune or nothing' campaign a top priority of the first Chavista administration. The Ministry of Popular Power for the Communes and Social Movements has been charged with the promotion and registration of communes; the Ministry also coordinates the numerous supportive services, including the benefits of the various social missions, training opportunities, and financing instruments that are generally available to incipient communal organizations. As registered organizations, the communes are supposed to have a voice in local, state, regional, and national governance. Chávez, H. F. Julio 2009. Comunas, Propiedad, y Socialismo; Al Principio Era El Socialismo. Alo Presidente Teórico, Programa No. 1. And No. 2. In Colección Cuadernos para el Debate. Caracas: Ministerio del Poder Popular para la Comunicación y la Información, 65. See Daal, U. 2013. Dónde está la Comuna en la Constitución Bolivariana? 4.4.2, formulación de planes comunes en correspondencia con el Plan de Desarrollo Económico y Social de la Nación.